Today, the worldwide Catholic Church begins the Year of Faith, which Pope Benedict XVI called for in his apostolic letter, Porta Fidei. The year begins today, which is also the 50th anniversary of the beginning of the Second Vatican Council, and the 20th anniversary of the arrival of the revised Catechism of the Catholic Church. The Year will end on November 23, 2013. During the Year of Faith, the Church encourages us all to remember that faith is a gift from God that must be cared for and developed. The Year of Faith calls all Catholics to deepen our knowledge of Jesus, Our Redeemer, through celebrating the Eucharist and the other sacraments, through study and prayer, and through sharing our relationship with God with others. So, how can you participate in the Year of Faith? Check first with your local parish or diocese for special events and activities planned. But the Redemptorists already have a few things on tap. Have you attended a Redemptorist parish mission? Check our online calendar to find one near you. Would you like to host a Redemptorist mission in your community? Have your pastor contact Fr. John Murray at missions@redemptorists.net or by calling 917-364-9244. Can’t make it to a mission? You can listen to Redemptorist preaching daily on redemptorists.net with our audio homilies, available in English and Spanish. Also be sure to check out our weekly video homilies, part of the regular Novena to Our Mother of Perpetual Help from Mission Church in Boston. Beginning November 28, our annual online Advent reflection series begins. Check back every Wednesday for a new meditation. Stay tuned as the Year of Faith gets going for several new features on redemptorists.net, including a series of short videos and written essays on important faith topics. Also keep your eyes out for some reflections from Redemptorists on their experience of Vatican II, including perspective from the Class of 1962 who began their ministry just as the Council got underway. 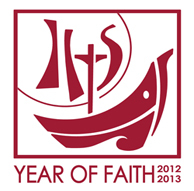 For more information on the Year of Faith, click on the links below.